Here is the 1937 Hauser top plan. I’m using R. Brune’s plan and notes. This is traditional Spanish style building. (I’m not sure how this is like Hauser’s method or not.) 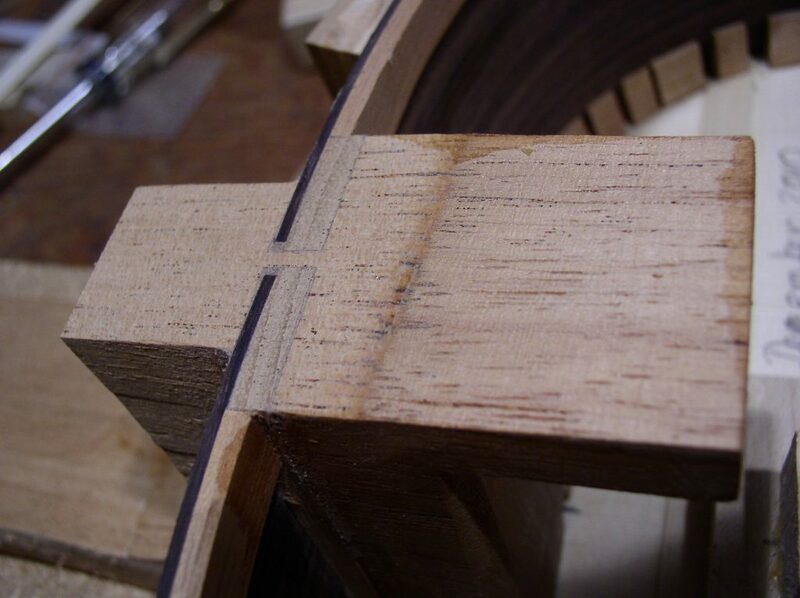 The top is braced, then mounted on the solera workboard. 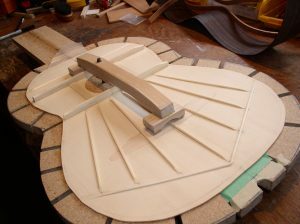 From here, the neckis aligned and then glued. 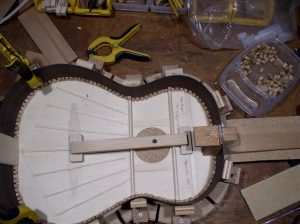 Then the sides are fitted to the neck and top. This entry was posted in Hauser, Uncategorized. Bookmark the permalink. I love this. Hope you’ll keep posting. Good! (Thanks for the encouragement.) I hope you will keep looking. I really like the feel of your work area, spacious with that special warm wooden colour touch. I like the blog report, the picture, the development of the work through the numerous building process. looking at your pictures a quote by Dali came to my mind, he once said that he liked the sound of his paint brush on the canvas, it reminded him of the sound of bees at work … day in and day out! … And the picture of your work in process give quite the same feeling of continuous devotion! I am looking forward to see more picture until the day I can (hopefully) hear this latest beautiful work of yours! P.S. Micah’s rosette are beautiful! Excellent photo documentation and attention to detail…… Thank you for making me aware of your blog and I will continue to check in and find out what you are up to. Keep up the fantastic workmanship. Please keep in touch. I appreciate your visit. We will stay in touch.